In the year since Crimea was absorbed by Russia, foreigners living in the country have had to make adjustments due to sanctions and rising geopolitical tensions. Has Crimea affected their day-to-day lives? Elizabeth Bagot, 27, is an American from Kansas who works as a professional translator. She has lived in Russia for 4.5 years and is based in Moscow. Bryan McDonald, 35, is an Irish journalist. He has lived in Russia for five years and is based in Sochi. Richard Winterbottom, 31, lived in Russia for eight years teaching English before recently moving to London. RBTH: In your opinion, have attitudes towards foreigners in Russia changed in the year since Crimea's absorption by Russia? Elizabeth Bagot: Yes, attitudes towards foreigners appear to have changed since the annexation, not so much on a person-to-person level as on a rhetorical and abstract level. I have heard a lot of anti-American rhetoric on social media and in discussions with Russians, but the same holds true for anti-Russianism from my American friends. Never once have I been treated differently on a personal level in Russia. This is probably because I speak Russian fluently and don't loudly express political opinions. Bryan MacDonald: Yes, definitely. The usual Russian warmth and curiosity towards west Europeans is gone. However, it isn't nasty yet in any way. That said, I believe it's pretty bad for Americans. I've also noticed that Russians are less interested in the EU/Europe as a place to visit/work. RBTH: What is your attitude towards Crimea? Do you feel strongly either that it should be part of Ukraine or Russia? B.M. : I believe in the principle of consent. It should belong to whatever the majority of local people want it to belong it. In this case, it appears to be Russia. But another referendum, with proper international monitoring, would be a good idea. E.B. : No, I don't have a strong opinion about Crimea. In tense political times like these, I consider it very important not to take sides without being fully informed. Because we are in the midst of an information war, it is virtually impossible to have full information and form a solid position. I understand reasoning on both sides - American and Russian. The waters are very muddy in this situation. I don't believe it right to annex a territory in violation of international law, but beyond that I am reluctant to choose a side. RBTH: Have you ever been in Crimea? Are you interested to go there? Do the events of the past year make you more or less interested about it? Richard Winterbottom: The Crimea has been an area that's always interested me, not least because it's always seemed to cause such a stir. In my eight years in Russia as an English teacher I found myself having many a conversation, both in and out of the classroom, on the topic with a plethora of Russians, many of whom lamented its loss and berated [Former Soviet leader Nikita] Khrushchev for his heinous act of betrayal [by making Crimea part of the Ukrainian Soviet Socialist Republic in 1954]. It's not, however, a place I ever managed to visit and while there was a time in which I would have jumped at the chance to go and even felt jealous of friends who had, I think I'm probably more turned off by this idea now. This is not for political reasons - I'm actually still not quite decided on how I feel about the annexation/legal absorption of Crimea into Russia - but more for the fact that I expect any Russian, by which I mean one not native to Crimea, I might meet there will be intolerable. One Moscow acquaintance, to demonstrate the sort of person I mean, stated back last April that she had never wanted to go, but now it was Russian she was already booking her trip, presumably as some sort of demonstration of misplaced patriotism. It's that kind of ridiculous attitude that I can do without. As to what Russia's taking of the Crimea has done to its reputation here in the UK, let's just say that, since returning to London last autumn, I find myself defending Russia and Russians a lot more than I ever had to before. The phrase "new Cold War" is kicked about in parliament and pub chat alike, and there's hardly a news week in which Russia doesn't feature prominently, be it assassinations next to the Kremlin or the scrambling of British jets to ward of their wayward Russian counterparts. E.B. 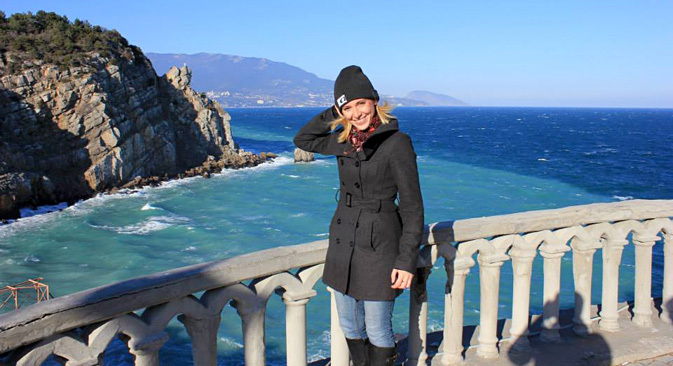 : I traveled to Crimea on the long Women's Day weekend in early March. I was reluctant to go out of fear that I would be caught out as an American and targeted. But I went to Crimea with two Russians and spoke only Russian, so I had no issues. I would not recommend traveling to Crimea for Americans who don't speak Russian, because they will be noticed, probably not in a good way. General sentiment in Crimea appears to be radically pro-Russian at the moment, so it is not the best place for loud English speakers eager to express an anti-Russian position. Crimea is a beautiful place and an absolute gem. It is unfortunate that Crimeans, particularly certain minority groups, have to suffer so much as a result of geopolitical games. B.M. : Yes. 4 times. Interestingly, I was there in the summer of 2013, its last Ukrainian summer. I then went back in December of 2014. Not much had changed. The place always felt more Russian than Ukrainian anyway. If you expat and live in Moscow, participate in our survey!